The number of monthly Oklahoma earthquakes has fallen 86 percent since a June 2015 peak, according to a recent Energy in Depth review of Oklahoma Geological Survey data and media reports. The latest data also show that potentially “felt” earthquakes, those registering magnitude 2.8 or greater on the Richter scale, declined 76 percent in September when compared to September 2016 totals. These declines have come at the same time that oil production in the state increased 11 percent (as of July) and rig counts increased 81 percent from a year ago. In fact, with 127 rigs in operation last week, Oklahoma remains the second-most active state in terms of drilling activity in the country. In other words, a whole lot of fracking is going on in the Sooner State. 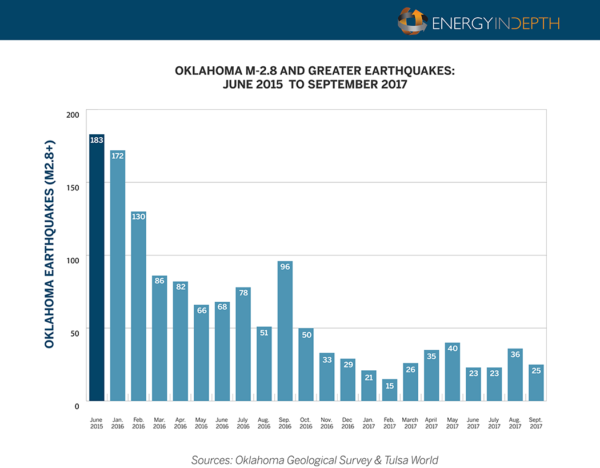 So how can earthquakes be declining at the same pace drilling is increasing if fracking is really the cause of Oklahoma’s earthquakes, as the media has so often reported? That’s because it cannot be emphasized enough that experts agree the fracking process is not responsible for Oklahoma’s increased seismicity, despite what a seemingly endless stream of headlines have suggested. A vast majority of Oklahoma’s earthquakes have actually been linked to wastewater injection, a completely separate process from fracking. Moreover, the vast majority of wastewater being injected into disposal wells is not related to fracking, either. This produced water is also known as brine or formation water and is typically ancient ocean water. It is not used fracking fluid, sometimes called flowback. In the areas of Oklahoma recently plagued by seismic activity, wells typically co-produce a large amount of brine, sometimes 10 to 15 barrels for every barrel of oil produced, according to OGS director Jeremy Boak. Back when oil prices were well above $100, such wells suddenly became far more economical, leading to an increase in drilling in these regions and, subsequently, a significant increase in produced water from day-to-day production that needed to be disposed of in Class II injection wells. Since identifying wastewater injection as the likely cause of Oklahoma’s increased seismicity, numerous measures have been taken by the Oklahoma Corporation Commission to reduce wastewater disposal volumes — which, again, are typically 95 percent brine from day-to-day production — in earthquake prone areas. Oklahoma regulators have implemented measures that have either shut in or reduced volumes of injection in roughly 700 disposal wells, reducing wastewater injection volumes 40 percent from 2014 levels. Though these more than a dozen directives — which included increased monitoring, well plugging, and volume reductions for hundreds of injection sites near seismic events — have resulted in a “significant economic impact,” they have been largely supported by industry and have proven effective. Not only has earthquake activity decreased in concert with wastewater volume reductions in Oklahoma, seismicity has also continued to decrease as drilling activity has boomed in recent months in Oklahoma’s SCOOP and STACK plays. The fact that wells in the these plays have very low hydrocarbon-to-brine ratios — and therefore do not produce large volumes of produced water that needs to be disposed of in injection wells — explains why earthquake activity has continued to decrease and also illustrates the fact that the actual fracking process is NOT the culprit. A recent OGS analysis confirms that conclusion. After reviewing earthquake data from 2011 to 2016, OGS found that just 282 of more than 23,000 measurable earthquakes (M-0.1 and greater) in Oklahoma during that timespan occurred within two kilometers of hydraulically fractured wells within a week after those wells were stimulated. Most of those 282 earthquakes were also close to oil and gas wastewater disposal wells. In other words, just 1.2 percent of these earthquakes can even be tangentially linked to the actual fracking process. A recently released database from researchers from the United Kingdom’s Durham and Newcastle University also shows that mining (37 percent), water contained behind reservoir dams (23 percent) and conventional oil and gas extraction (15 percent) are believed to be the primary causes of documented man-made earthquakes since the 1800s, with the actual fracking process linked to just four percent of induced seismic events cataloged.